OMG!!! That's so weird!!! I was just thinking about Virgin America, too!!! Remember when I said I loved working on airlines? Well, here we are minutes later and the same holds true. 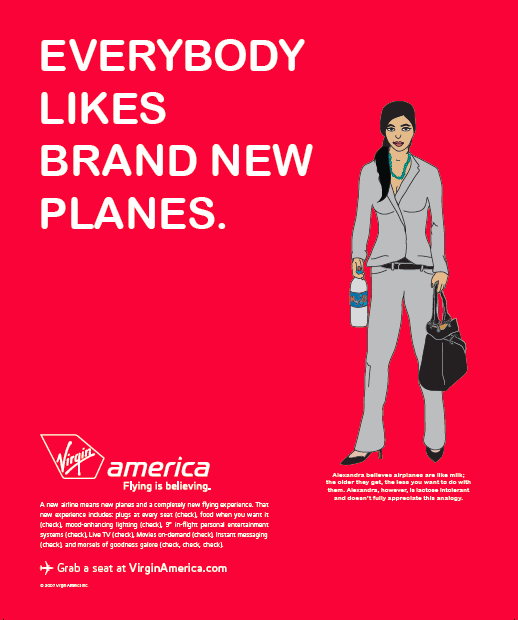 One of my first tasks at Anomaly was launching Virgin America back when Virgin America wasn't an airline, but simply an idea. I helped develop the personality for the brand and was even the writer of the Virgin America safety video, widely credited as the first creative safety video. Of course, there was more to the launch than just the safety video. There was a slough of communications — everything from print ads and taxi tops to airport signage. Below you'll find a few examples of those. Print. A range of these characters designed by Ian Ghent appeared throughout the campaign. Welcome signage as passengers disembarked. This one, I believe, is still up in Vegas. Behind the welcome desk at SFO. In-flight content for Virgin America's fledgling entertainment systems. Click the image for the films. We even did bag sizers. Also known as: those thingies you put your bag into to see if it's too fat to fly.